Is the Mall a good idea? Click on the links below to read both sides opinions and form your own opinion. Will it lead to pollution, traffic and additional tax burdens? What will become of the land if it is not developed for the mall? Are we going to lose more green space than we should? Or will the revenue windfall keep our property tax rates in check? March 19, 2000 -In reference to the employment at the new mall, "the annual payroll is targeted to be $177,000,000. Once the mall and the out-parcels are fully developed, the estimated total tax revenue paid to the schools, the city, the counties and the state is $58,000,000. (By the way, state law does not allow tax abatement for commercial developments as it does for industrial developments.) This generation of new tax dollars can play a major role in providing for not only the schools, but the entire region." according to Leonard L. Robinson, realtor for the land. A petition for the support of the proposed Kyles Station Road Interchange on I-75 (approximately 1 mile south of I-75 and State Route 63) is currently being circulated. The new interchange is the first step required for the new mall. If you are interested in signing the petition, please contact Leonard Robinson at 539-2000. Last Fall a local news source reported that Real Estate Developer Taubman (headquartered in Bloomfield Hills, Michigan), was considering developing a Super Mall in Monroe, Ohio. Taubman is a regional shopping center developer with properties across the United States. The average rent per square foot of $43.09 is charged in Taubman properties. Since the Mall has to be approved by the Ohio Department of Transportation first, letters in support are needed for the project. Information content of the letter and who to send it to will be updated here. In the meantime here is ODOT‘s home page and contact links. Taubman, the Monroe Mall developer has applied to the U.S. Army Corp of Engineers to modify the current location of a small portion of Miller‘s Creek. This is the first step in getting a new mall in Monroe. The location of the creek is east of I-75, north of Kyles Station Road and south of Route 63. According to Leonard Robinson, real estate broker for the deal, "The creek is currently is nearly dead, the banks are eroded and it only contains water a few days per year. This creek will not get better without intervention. By rerouting the creek, we will improve its condition." Today a representative from The Taubman Company (Mall Developer) met with the newly formed Monroe Business Council.. Joseph K. Hart Jr. is in charge of the mall project. He is Manager of Development for The Taubman Company. Value Center - The project is considered a "Value Center" type mall. There is a Taubman Mall in Auburn Hills, Michigan that is representative of the "Value Center" mall considered for Monroe, Ohio. 1. There are 14 to 17 anchor stores with a minimum of 20,000 square feet each. This is different from most malls that have 2 or 3 anchor stores. 2. There will be sports available. Basketball and racquetball courts were specifically mentioned. 3. Entertainment such as "Theme Restaurants" and a 25 screen movie theatre. (Rainforest Restaurant is an example of a "Theme Restaurant"). If approved, the mall will have 1.4 Million square feet of retail space situated on 360 acres east of I-75 and south of St. Rt. 63. The project would be located south of the current structures in Corridor 63. The realtor involved is Larry Robinson at Robinson-Lawton-Kent. July 12, 2000 - According to Lenny Robinson, the realtor for the Mall Project, "The Mall is very much alive and still on target. This is a long term project and Taubman still has a long term option on the property. The mall is certainly not near death‘s door and we didn‘t ask to be on anyone‘s prayer list." 1. Taubman as recently as a few weeks ago was working with the Butler County Engineers Office on a sewer project (trunk sewer line) affecting the proposed mall land. 2. The mall property is not on the market for anyone else to buy but Taubman. If the mall project were dead, that property would be on the market. According to Michael Cull, coordinator for TRAC, the Cincinnati Council, the Dayton Council, and the Sierra Club oppose the interchange. He said the review council will definitely weigh the opposition‘s opinions, but whether or not their opinions are enough to stop the project remains to be seen. Cull said the council would decide on the future of the project after the justification study has been reviewed. The Taubman Company, interested in developing a 220 store shopping mall on land located at I-75 and Ohio 63, is paying for the justification study. April 10, 2000 - It was the Middletown Journal‘s top story on April 7th, "WARREN BACKS OFF MONROE MALL." The story was misleading because the residents of Monroe were led to believe that Warren County had the final say. The proposed mall site is in Warren County within Monroe city limits. According to Bob Price, County Administrator for Warren County, "Warren county has no say on whether Monroe gets a mall." Only the Monroe Council has any say on the Mall. Additionally, Warren county is in favor of the proposed I-75 interchange. Traffic from I-75 to I-71 is heavy and projected to be heavier when Rt. 63 is extended to Trenton. Mr. Price went on to say, there are zero residents that live in both Warren County and Monroe. All the residents of Monroe live in Butler county. Support The Monroe, Ohio Mall! 1. Write your State, County, and City Officials and let them know that you support the proposed Mall and new interchange. 2. Ignore the negative Mall hype! It has no basis and seems to be supported by other Malls to eliminate any possible competition! If you don‘t believe this contact the Trotwood Chamber of Commerce, who just objected to the Mall and interchange, because they feel it would hurt their Mall. People, the Taubman group would not invest $200,000,000 on a new Mall if there was not a market for it! THINK ABOUT IT!!!!! 3. Email or Write to Michael Cull at ODOT and show your support for the new I-75 Kyle‘s Station Interchange! Here are some warren county commissioner email addresses. We urge you to email them your opinion. Monroe Mall, Just Another Outlet Mall? In an interview with the Cincinnati Enquirer, Scott McCarthy, Vice President of Development with the Taubman Co, Bloomfield Hills, Michigan Developer said the plans for the mall are extremely preliminary. Mr. McCarthy said he foresees a 1.7-million-square-foot enclosed mall with 1.4 million square feet of leased space, which could be occupied by T.J. Maxx, the Brooks Brothers outlet, an Ann Taylor outlet, movie theaters and entertainment-themed restaurants. Mr. McCarthy said his company has been looking at Greater Cincinnati for a few years. The Taubman Co. has billed the project as an upscale shopping and entertainment attraction - one that may draw more than the 3 million visitors who come to Paramount‘s Kings Island each year, said Warren County Commissioner Pat South. Based on Taubman‘s work on other malls throughout the country, Commissioner South said she expects anything but the typical suburban mall sprawl. "What really intrigues me about the company is that by the appearance, it will not be an obtrusive looking mall as we have come to know malls," she said. "It is supposed to offer a lot of green space appearance and a lot of trees and openness." Is it going to be just another outlet mall? I think not. 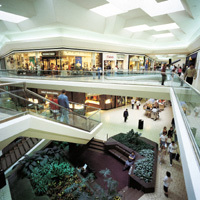 In 1998, sales in Taubman centers averaged $426/sq. ft. This compares to a 1998 national average of just over $200/sq. ft. for all regional malls.